Missing teeth can cause problems that extend far beyond someone’s ability to eat and speak. Missing teeth, especially a front tooth, can sap a patient’s self-confidence to the point that it virtually disappears. At Woodside Dental Care, however, we’re all about providing solutions for our patients in Freetown and Assonet. Using custom-made restorations and an artistic touch, we can seamlessly replace any number of missing teeth, helping patients recover their bite and appearance at the same time. If you’re ready to say “goodbye!” to the gaps in your smile, give us a call, and we’ll be happy to go over all of your options. 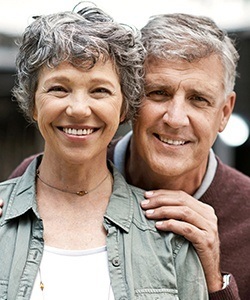 Why Choose Woodside Dental Care to Replace Missing Teeth? As with most dental problems, tooth loss only tends to get worse when ignored. In most cases, the remaining teeth will eventually start to drift into the open spaces, which can cause the bite to misalign. Patients with missing teeth are also much more likely to develop gum disease, which itself is the leading cause of tooth loss in the US. Thankfully, this kind of chain reaction can easily be stopped by any of the replacement options we have detailed below. For patients missing one or more teeth in a row, a dental bridge is a strong and reliable solution that has been used for decades. 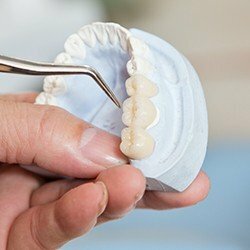 Dental crowns are placed on the teeth on either side of the missing ones, and these help support a prosthetic that literally “bridges” the gap. With one, we can restore balance and function to the bite and bring back a patient’s natural appearance at the same time. 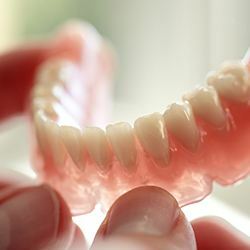 Modern-day dentures are more comfortable, natural-looking, and durable than anything your parents or grandparents might have worn. Whether you are missing a couple of teeth or all of them, we can design a denture that instantly restores your complete smile. Partial dentures can replace multiple teeth along a single arch like a piece of a puzzle, while full dentures can bring back an entire row at once. Patients can even opt to get an implant-retained prosthetic so they can enjoy the most stable and secure fit available today. When it comes to dental implants, dentists around the world agree: they are the gold standard of tooth replacement. 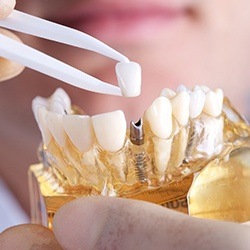 They are the only treatment that restores an entire tooth both above and below the gum line, creating something that is the next best thing to nature. 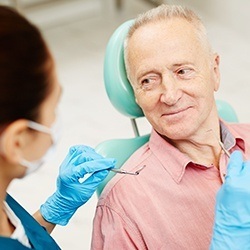 They can be used to replace a single tooth or multiple missing teeth, and now, you can get them right here at Woodside Dental Care. These “bionic teeth” as Dr. Cornetta likes to call them tend to last longer than any other dental restoration, too. You can expect your implant to last over 30 years.